Hello and welcome to the 16th installment of the SWD. It was an eventful day in the governorate of Aleppo with events mostly taking place in the eastern part. A couple of days ago there were some rumors about Turkish army razing buildings on Sheikh Aqil hill west of Al-Bab, today news came out about Turkey constructing a temporary military base in that area, so there might be some truth to the rumors. However, before accusations are thrown about Turkey displacing people and destroying their homes, it is important to note that there probably isn’t much left of the buildings there as heavy clashes occurred in that area for the past 2 months and that is most likely why Turkey decided to make base there, plus it provides a great vantage point over Al-Bab. TFSA advanced today against SDF in the direction of Manbij taking village of Jubb Al-Hamir, pro-rebel sources also claimed capture of Kirijah, but village was never under control of SDF, this is just a PR victory in order to make today’s gains more significant. It is still unclear if TFSA launched a Manbij operation or if this is just a preparation, to make things more confusing as were will be next TFSA offensive, Tal Rifaat military council stated that they are planning an offensive to reverse gains made by SDF all the way back in February of 2016, either some misinformation is intentionally being spread or we might see double offensive against SDF. However, it is doubtful if TFSA has enough men and resources to launch two offensives, to support this “double offensive theory” there were reports of Turkey sending more APCs to Syria, number reported was 22. SDF reportedly repelled TFSA attack towards Abu Hayj. Recent TFSA attacks on SDF might make the latter abandon its own eastern Aleppo offensive towards Al-Khafsa in order to protect Manbij. Speaking of Manbij, Turkish president Erdogan repeated today that the next phase of Euphrates Shield is city of Manbij. Earlier in the day, SDF captured Jubb Abyad and Al-Birah witch clashes going around Al-Khafsah. SAA Tiger Forces continued to advance in eastern Aleppo, taking control of Al Taiha Twimat, Halesiyah and Al-Mudiyah. Advances were made in order to further secure route with SDF and create a larger buffer area. Rebels showed footage of at least 2 captured SAA soldiers and claimed a dozen more killed in Qaboun farms. This development shows that pro-government sources lied or exaggerated when they claimed control of 90% of Qaboun farms couple of days ago. Clashes continue between JKW and rebels in southwestern Daraa in Tasil-Adwan area, some reports suggest that counterattack launched today by rebels was repelled and scores of them were killed, take this with a grain of salt as it can’t be verified yet. Rebels created an operation room aimed at expelling JKW from Yarmouk region, creation of an operations room shows higher level of commitment in a battle against JKW, compared to the last attempt that happened somewhere a year ago. 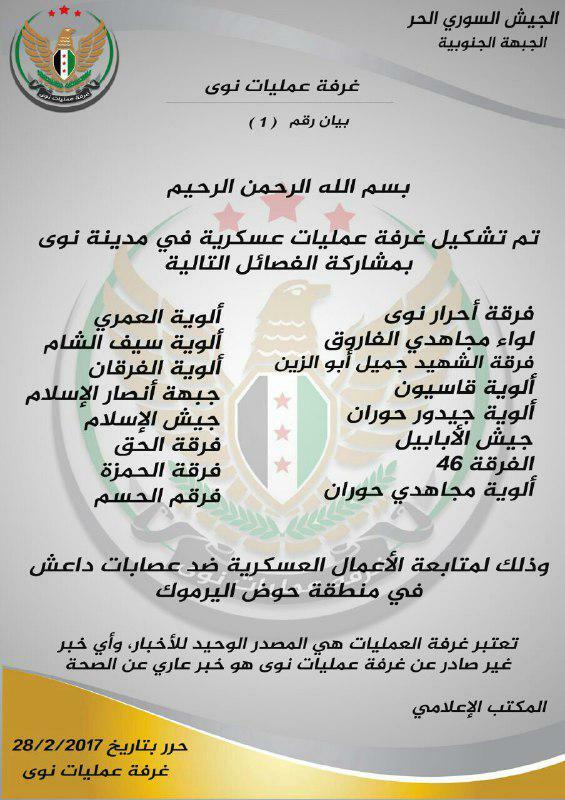 16 groups are a part of new operations room, the only notable faction involved is Jaysh al-Islam, full statement can be found here. Jordan keeps putting pressure on rebels involved in an offensive against government forces in Al-Manyhiyah district. Latest reported measure enforced by Jordan is expulsion of families of the rebels killed in recent offensive. Jordan is really going all-in in an effort to stop the offensive, however, expelling refugees is overstepping the boundary and a shameful act. 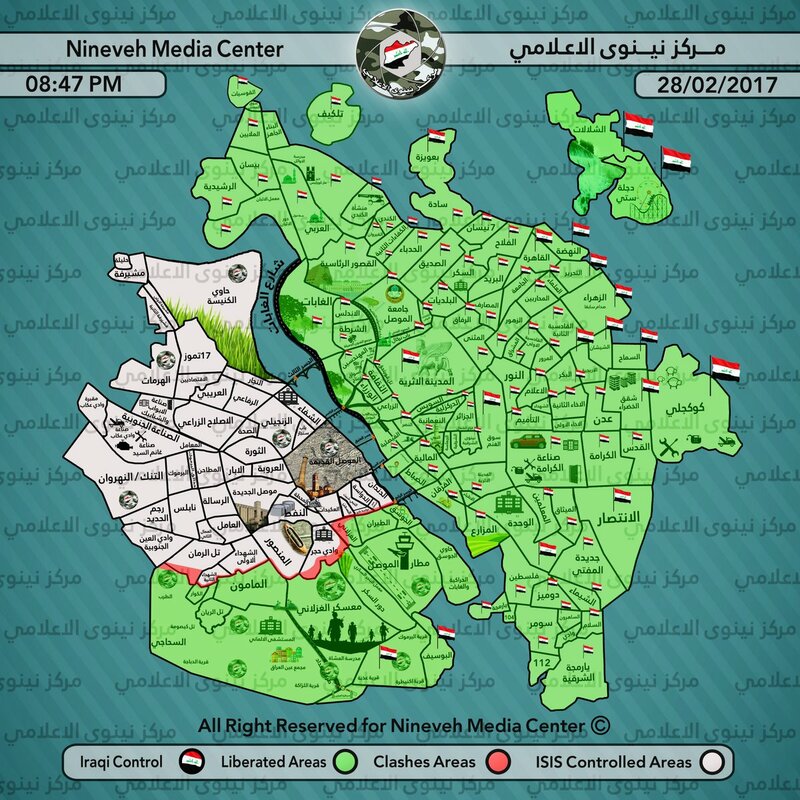 Today’s advances on the Mosul front were concentrated on the western outskirts of the city. Village of Al-Damreji Al-Saggira and Mosul water treatmen plant were captured, with these advances Mosul is cut from Tal Afar. It looks like Iraqi air force will continue activity over Syria, a deal was reportedly reached between Syria and Iraq, Damascus will provide intel and Iraq will do the bombing. Operations room is being established and its goal is removal of IS from both countries. It still remains to see what will be the scope of Iraqi airstrikes, will they just focus on border area and let inner Syria to SyAAF or will they bomb IS in every governorate it exists. New convoy of vehicles and armored vehicles destined from SDF left Iraq in the direction of Hasakah. Recent deliveries of vehicles to SDF shows a shift in the policy towards SDF, new US administration is more direct and active in providing military aid to the group. However, these new deliveries could escalate conflict further with SDF being stronger and less interested in a political progress with other groups. If these constant deliveries continue, SDF might be strong enough to declare independent Rojava and with all that military equipment, strong enough to maintain its independence. On the 27th of February 2017 CJTF-OIR has conducted 14 strikes in Syria. CJTF-OIR‘s main focus in Syria at the moment is still Raqqa where they did 8 strikes supporting SDF‘s operation against IS destroying four fighting positions, two ammo caches, a mortar system, a vehicle, a chemical weapons facility and an IS headquarters. Other areas where strikes occurred include Deir al-Zour and Palmyra destroying five wellheads & an oil manifold and six pumpjacks, respectively. Full report on CJTF-OIR strikes conducted in both Syria & Iraq can be found here.